Drummers and Singers This is one of the groups of drummers/singers. 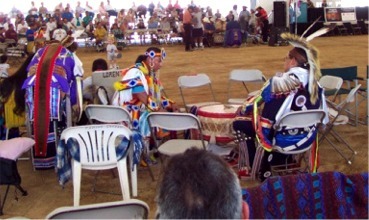 As best I can tell a Powwow is kind of like a big family reunion. There are many Indians from many Nations. 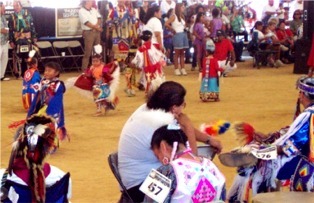 They are also a competition of dancing, singing and drumming. This is a shot of the dancing. The lighting here was very difficult to get good photos. 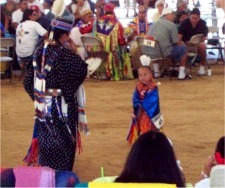 The first powwow we went to was about 10 years ago in New York I believe the town was Salamanca. It seemed to be a lot less commercial. They have classes for the little ones to compete. 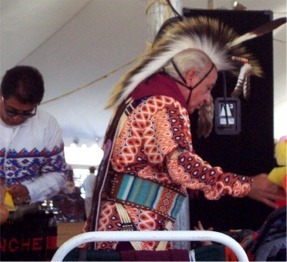 It was really very cute to see them in their colorful costumes dancing to the drums. Planning strategy for the dance. 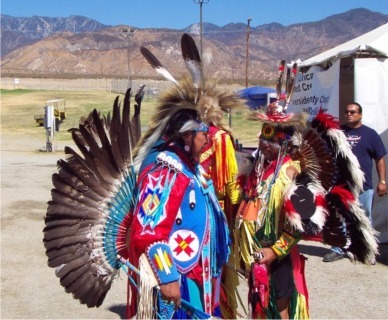 I find it very hard to get information on just what the powwow really is. They seem to want the white man their but don't make it easy for us to understand. 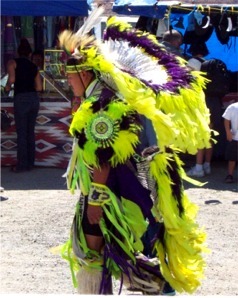 He is getting ready for his turn to go out and dance. The costumes can be very colorful and pretty. Much more so then the last one we saw 10 years ago.